Working with natural products demands a certain degree of flexibility. Constant utilisation of the diversity of raw materials per season or per batch demands adaptability as well as testing in order to deliver a product of consistent quality. Consistent product quality is ensured by using advanced machines which can even be adjusted to a specific batch. Hooymans Compost B.V. attaches great value to innovation, as the mushroom industry keeps changing and never remains the same. So it is not surprising that there is an in-house R&D department that carries out tests daily, but is also continuously engaged in improving the process. The plant, which uses sustainable materials and techniques, also contributes to this goal. 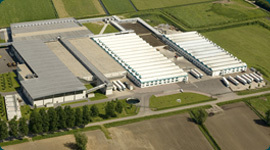 We are currently working on a new website that connects to our new name Hooymans Substrates. The information shared on this site will remain correct.